There are many replicas of the iconic 1956 C1 Corvette SR, otherwise known as ‘The Real McCoy’, but this isn’t one of them. That’s right – the car you’re looking at here is the actual car that finished ninth overall at the 1956 12 Hours of Sebring, and it will soon be sold to a lucky new owner by Mecum Auctions. The Real McCoy’s origin story actually begins with Ford. 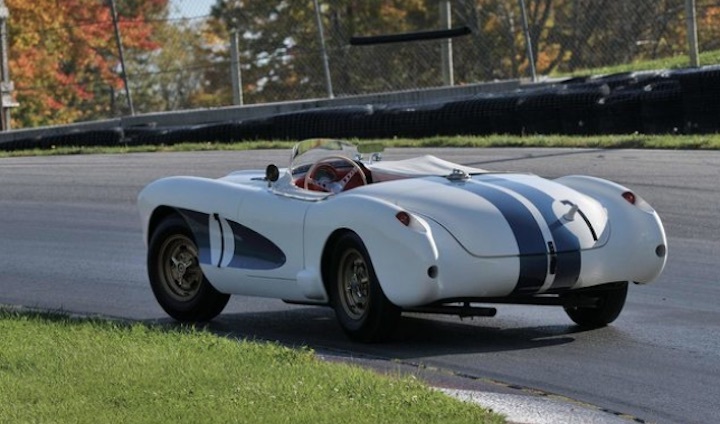 In 1955, the Blue Oval’s new Thunderbird was vastly outselling the older Corvette, so Corvette chief engineer Zora Arkus Duntov devised a plan to further the Corvette’s sporting credentials and boost sales. Duntov soon set to work on the new performance focused Corvette prototype, fitting it with a specially prepared 307 cu. in. V8, which made a robust 255 hp thanks to the addition dual Carter 4-barrel carbs and the storied “Duntov cam.” A number of other racing upgrades, including a four-speed ZF transmission, the first 4-speed manual fitted to a Corvette, were installed as well. To test his new creation and promote the Corvette brand, Duntov showed up to the 1956 Daytona Speed Week and broke the record for the Flying Mile with a two-way average of 150.583 mph. Chevy chief engineer Ed Cole, inspired by the Daytona outing, then came up with the idea of entering the test mule in the 12 Hours of Sebring that March. Duntov expressed concerns over the plan, as the car wasn’t designed for endurance racing and GM had limited racing experience, but he was promptly reassigned within the company, GM electing to show up to Sebring anyway. After some help from now legendary mechanic Smokey Yunick, The Real McCoy and two other Corvettes were entered in the Sebring race under the Raceway Enterprises banner. The Real McCoy finished first in class (the Chevys were the only cars in their class) and ninth overall – a huge success considering GM’s limited endurance racing experience. The Duntov-developed prototype will be sold at Mecum’s Kissimmee auction later this month. There’s no telling what it will go for, but apart from the original V8 Duntov test mule, this could be one of the most historically significant Corvettes of all time. It’s Mecum. It will have a ridiculous reserve and it won’t sell. They pull this all the time. On Sunday, I kept track of how many cars sold vs how many didn’t sell at the Mecum auction in Kissimmee. Out of 58 cars that rolled over the auction block, 19 sold. There were more than 58 that rolled over the block, but I was looking at cars or whatever.